On Saturday, November 18, the Bloor-Yorkville BIA will kick off the holiday season with Holiday Magic, the spectacular annual community concert event in support of the Canadian Foundation for Aids Research (CANFAR). Between 5:00 pm – 6:30 pm, families, friends and music lovers are invited to this FREE EVENT in the Village of Yorkville Park (Cumberland & Bellair Streets) for the Official “Flick the Switch” Lighting Ceremony and an exciting live musical performance by Canadian R&B / Pop Star KESHIA CHANTE! Keshia Chante is a Juno Award Winner, 5x Urban Music Award winner, and 2x Radio Music Award winner; and has also been a television personality as co-host of BET's 106 & Park! This is a FREE EVENT and attendees can also look forward to complimentary hot beverages, as they enjoy the glittering lights, majestic Christmas tree and storefronts swathed in festive decorations. We thank our event charity partner Canadian Foundation for AIDS Research (CANFAR), and sponsors Yorkville Village, Global News Toronto, Toronto Star, Starbucks and Lindt for contributing to the success of this anticipated event. 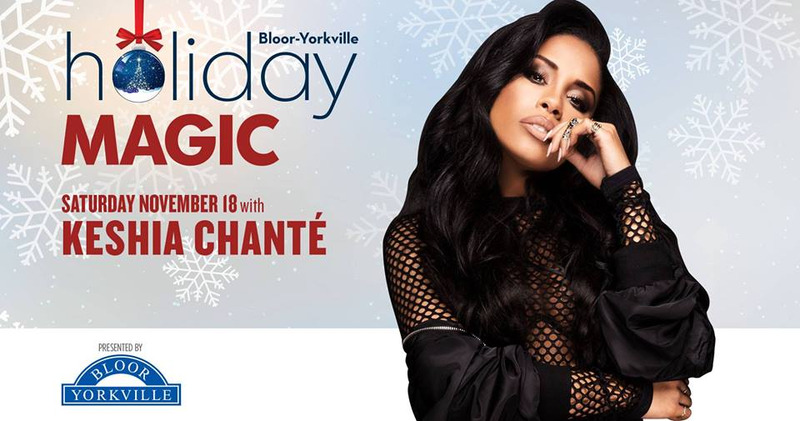 Don't miss this performance, as Keshia Chante rings in the holiday season in Bloor-Yorkville!